Hidden amongst layers of dead cells lies a beautiful delicate gem, your skin. 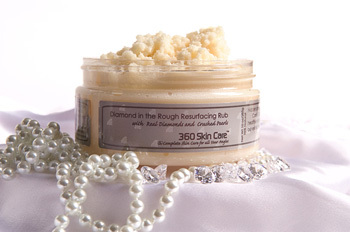 Let 360 Skin Care’s Diamond in the Rough Resurfacing Rub take you on a journey to discover healthier skin that sparkles from within. Rich in nourishing oils and decadent butters our exfoliating body scrub transforms into a hydrating moisturizer crammed full of amino acids and natural minerals that smooth, soften and condition your skin.